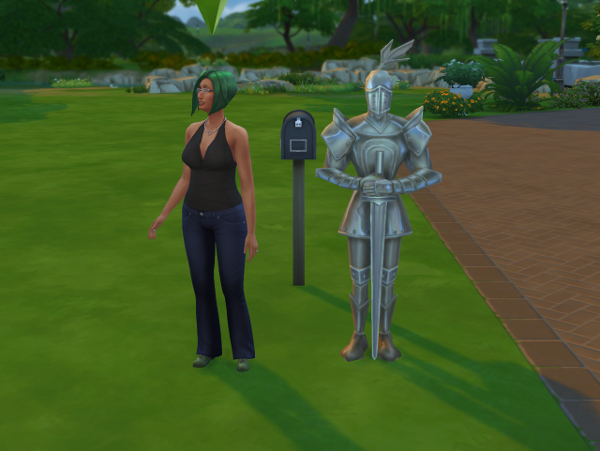 Last October Lemongrass Pigglewiggle found herself in an empty field in Willow Creek standing next to a large suit of armor. Thus began my first ever legacy challenge. 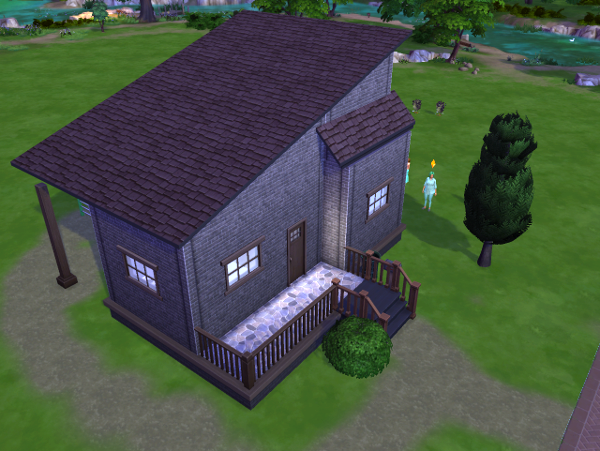 I had attempted a similar challenge back when I played Sims3, but it didn’t go very far before I abandoned the project. Why is this one still going strong 9 generations later? I have no clue. Perhaps it’s that I like the Sims4 better as a game, or that I’m actually following the rules which help keep me focused? Or the fact that whenever I get tired of the game, an expansion is released which gets me interested in playing again? Whatever it is, I have complete confidence that if this legacy fails, it won’t be because I quit playing. I’m keeping track of the score here: rules and scoring. Read the Posts for Generation 1 and 2. Lemongrass Pigglewiggle: Creative, Childish, Romantic Lineage aspiration. She was a writer which gave me plenty of time to explore MY favorite career. I wanted to be an author when I grew up. Lemongrass found and quickly married Mitchell who she was inexplicably attracted to for an outgoing, lazy, bro. Together they had three children (Charlotte, Austin, Arthur) and adopted a fourth (Conan). Austin: Gloomy, Creative, Geek. Fishing and Collector aspirations. I should have picked geek as my exemplar – I’ve ended up with so many. Second of four children. Austin cemented his heir status on his teenage birthday after picking up the illusive creative trait. Austin did well attaining his aspiration early on, but took his time finding a spouse and continuing the legacy. Eventually however he met Hilary and they had two children Reef and Coral. Conan (Cadet): Insane, Outgoing, Art lover. Conan never moved out of the house and he was my first gardener. Although he became an astronaut he never married or had children. Conan was buried in the tiny graveyard outside the family mausoleum. More generations means bigger house. Coral: Loves the Outdoors, Geek, Foodie. Party Animal aspiration. Through Coral I got through the legacy challenge of 10 kids in one generation and not a single one of them was a twin (even with the fertile trait!). Six potential heirs: Bond, AJ, Boris, Austin, Bourne, and Xander and four girls: Nikita, Natasha, Carman, and Kim. Boris: Creative, Hates Children, Hot-headed musician with the party animal aspiration. Stealing the heirship from his older brothers, Boris was my first “difficult” sim, but is is any wonder that with 9 siblings he hated children? He had two children anyway: Dylan and Sting. Carman (Cadet): Gloomy, Geek, Childish, Joke star aspiration and comedian like her grandfather. I tried for a proper Cadet branch and she and my second gardening sim: Topher has a single child, Mo. Read the posts for generations 5 and generation 6. Pools are added to the game and to the mansion. Dylan: Hot-headed, Good, Goofball. Her mansion baron aspiration was an easy win so she went on to strive for Nerd Brain. The astronaut career fit her perfectly although as the only heir she waited until she had a son before she traveled to space. She was a terrible tease having three girls first so that I had to kick out my cadet family before it had really begun. The very next child she had was a boy. Mo: Glutton, Materialistic, Perfectionist. For years Mo was our chef, perfecting the art of cooking and mixology. He married his childhood sweetheart Katrina and they had a single boy, Cocoa. Cocoa grew up with Dylan’s two eldest daughters, but the family was forced to leave when her third child was a girl as well. Meteor: Outgoing, Evil, Clumsy – Renaissance Sim. Yeah, my first evil sim that I had to play and I struggled to find his voice, but he’s coming to his own now. Nebula, Nova, and Cocoa – not only did they leave the Pigglewiggle mansion, they left the save and started up their own lives in Sidelines to help explore the Get to Work content that was released. They’re on long lifespan so they’re still all young adults. Read the posts for generation 7. 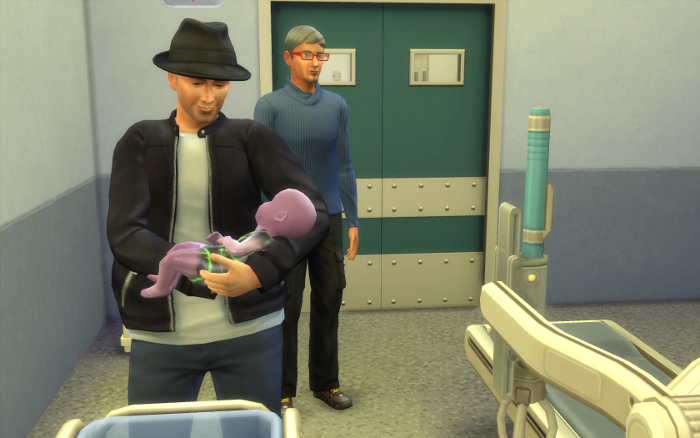 Aliens have been added to our game and to our legacy family. Harlequin: Genius, Evil, Geek – All the aspirations. She has done more in her life that almost any other sim. She’s been a writer, a mischief maker, a criminal boss, and now she’s concentrating on her family and working as a spy. She also helped completely redo the Pigglewiggle mansion from the ground up. It’s like playing a new game. Despite being evil, she’s been an awesome heir. Through her (and all the other evil sims), she’s forced me to come to grips with that most awkward of traits. Michelangelo: Love the Outdoors, Insane, Clumsy. As Harley’s twin, Michel is our narrator for generation 7 and has done an excellent job keeping us abreast of family events. I adore him. He’s our cook, our baker, our resident body builder, he kept the remains of the garden alive, and now he’s going to explore space which was his childhood dream. Both the twins had youth potions as adults so they’ll be with us for a while longer. Mina: Aliens have joined our game. Mina, our first alien child is the creative, evil, and ambitious child of Meteor’s spouse, Darin. Therefore, despite her creative trait, she’s ineligible for the heirship. Despite her evil nature Mina is one of the sweetest, most beautiful sims I know. She’s staying in the family as long as I can get away with it and still make her happy. Read the posts for generation 8. Bane: Art-Lover, Evil, Family Oriented. We’re continuing our evil streak but for some reason Bane really spoke to me this generation. He hates to be left out of anything. He’s in the business career. Despite his late start on the whole family thing, really family is what Bane is all about. Shelby: Black, White, Hungry. Everyone who comes to the Pigglewiggle Lot this generation notices Bane’s first love. We’ve kept it alive an entire generation too! Shelby has tasted everyone but Michel to it’s annoyance. Helped Bane find a wife, and babysat his children. What more could you ask for from a sim-eating cowplant? Luthor: Mean, Genius, Geek. Bane’s younger brother inherited his father’s alien skin. Which Bane did not. He’s sticking around as uncle this generation becuase after loosing our cook we’re not loosing our repairman – even if they’ve added them to the game at last. Luthor is in the athletic career and love to explore space on the side. He’s a bit of a genius jock/geek. Read the posts for generation 9. We’ve made it! Gen 9 gave us our second set of twins, Arianna and Elleanor and an end to the evil trait that has plagued the last three generations. Arianna went fishing for a husband, eventually and Elleanor kept Shelby and the garden alive. Arianna: Genius, Foodie, Family Oriented. More interested in fishing and playing chess than finding romance, but eventually it found her. In the basement, repairing a broken studio. And with that love came the final piece of our 10-generational puzzle. Guppy: Gen 10 baby. I rolled all his traits at the end out of curiosity. Perfectionist, hot-headed, and family-oriented. Thanks for reading! It’s been a blast sharing my adventures with you: Final Score 83. I WISH I could get 1/2 that far in a legacy. I imagine all of my failed legacy families just hanging out in the household management together trying to figure out what went wrong so many times! Looking forward to spending some more time in your fortress and reading your stories! Ah – Well this is my first time attempting a legacy for real. 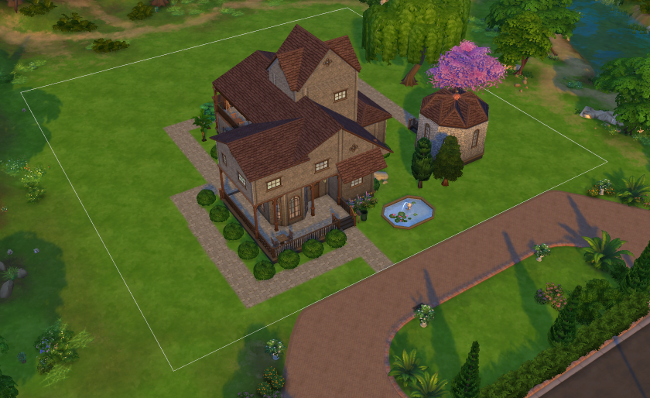 Although I tried and failed to get beyond generation 2 in TS3. The blog has helped keep me interested, and playing for points has given me direction that was otherwise lacking. Now I’m too far along to stop. Ha. I wonder what our sims says about us behind our back. Take a look around. It’s mostly all sims for now, but I anticipate going back to other games…maybe, someday. I never expected to be captured by Sims so thoroughly.